Did you know…It only costs $2.11 to provide a free lunch to a homeless individual? That’s cheaper than a daily cup of coffee! At St. Vincent de Paul Village of Father Joe’s Villages each day, up to 3,000 meals are served to community members who would otherwise be at risk of going hungry. The McKinney team is always eager to support Father Joe’s Villages, our local homeless shelter. St. Vincent de Paul Village serves the local homeless of San Diego as a “one-stop” center for housing and supportive services, such as health and wellness support, therapeutic childcare, clinical services and treatment, family literacy, career and education resources, parenting classes, and case management. The McKinney team has been involved with Father Joe’s Villages’ Health and Wellness Garden initiative for the past two years. At the start of the project, we collaborated to rebuild the garden boxes using power tools, and throughout the year, replenish their plant supplies and gardening soil. 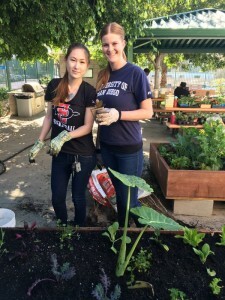 Earlier this month, my fellow team members and I had the opportunity to lend a helping hand at Father Joe’s Health and Wellness Garden. We coordinated supplies for new gardening soil, and spent a relaxing afternoon in the San Diego “winter” planting an array of vegetables and flowers. As a first-timer to the garden, I really enjoyed learning to garden using the “square foot” gardening system and creating different crop patterns within the soil alongside my team. After our gardening adventure, we were surprised with the residents’ culinary team, who had prepared a wonderful meal for us made from freshly harvested crops from the garden. Thank you to the team at Father Joe’s Villages for making this Health and Wellness Garden initiative possible! We are excited to help out again soon. Sarah Mammen works in the Marketing department of the McKinney Capital & Advisory team. Sarah collaborates with the Marketing Director to implement our strategic plan and ensures consistent branding across all marketing functions, while maintaining McKinney’s brand identity and cultural message.